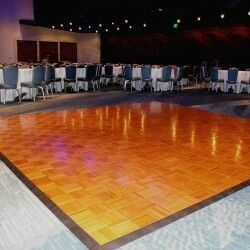 Our Dance Floors come in 3’x 3’ sections. We can assemble sizes from 6’ x 6’ up to 52’ x 52’ to accommodate both small and large events. Our Bil-Jax® stages come in 4’x4’ sections with adjustable 15” and 30” legs. Carpeting, skirting, steps, safety railing and handicap ramps are available for your event. Assembly included with the rental. Stage & Dance There are 7 products. Our Dance Floors come in 3’x 3’ sections. 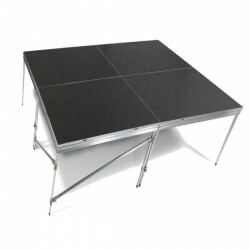 The Default size is 9’x 9’ (16-dancer capacity), ideal for small parties. For large parties, we recommend 15’ x 18’ or 18’ x 18’. Please choose your desired size and confirm your rental period. Rental price includes crew labor for set-up and dismount. 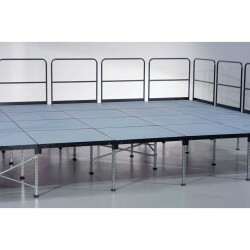 Our Portable Stages come in 4’x 4’ sections. You decide the size of your stage by adding sections as needed. Adjustable Height: 15, 30 or 48 inches from the ground. Please add sections to your cart as needed, select your height and confirm your rental period. Rental price includes crew labor cost. 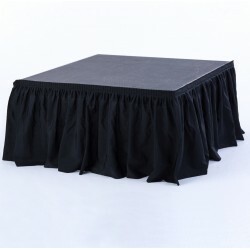 Our Portable Stage Skirts come in 4’x 4’ linear sections. You decide the length of your skirt by adding sections as needed. Adjustable Height: 15, 30 or 48 inches. Please add sections to your cart as needed, select your height and confirm your rental period. 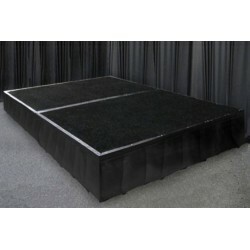 Our Portable Stage Carpet comes in 4’x 4’ sections, black color. You decide the size of your area by adding sections as needed. Please add sections to your cart as needed and confirm your rental period. 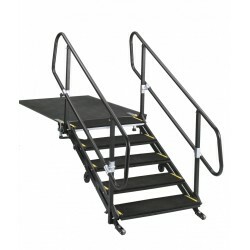 Made from an aluminum and steel construction that makes set up and storage easy, our Portable Stage Stairs come in 3 height category: 15, 30 and 48 inches from the ground. Please select your height and confirm your rental period. Rental price includes crew labor cost. Offer an easy, affordable solution to make any event ADA compliant, accessible and green. 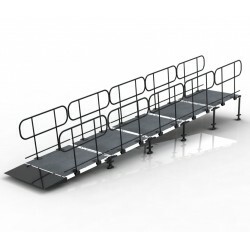 Our steel modular ramps are made from 100% recycled and recyclable steel. Please select your height and confirm your rental period. Rental price includes crew labor cost. Railings provide additional safety and can easily be added to any stage order. For stage 48 inches height, railings are mandatory. Rental price includes crew labor cost.